Dinner at Christina's: Salad - in a pie plate? Growing up in my parents' house we always had Correlle dinnerware. There's this weird dish in the middle there. Not quite as big as the dinner plate, but bigger than the bread/dessert plate. Nowhere near as deep as the soup bowl, but still could be considered a bowl. My brother and I always called them "bowl-plates." Occasionally a meal would call for us to set the table with "bowl-plates" and we'd always check first, asking "Bowl-plates, right?" Sometimes we'd contemplate. Would a dinner plate do, or a bowl? Nah - just use the "bowl-plates." You get the idea. I find it weird now, eating certain things in a house that only has a selection of a flat plate, or a very, very deep bowl. I'm used to eating gooey foods like homemade macaroni and cheese, along with hearty stews and soups in these shallow "bowl-plates." Tonight I decided on making a huge salad. We have a big bin of mixed greens I don't want to turn bad, along with tons of veggies in the fridge. There's always a fine line between fresh veggies and those stale been-in-the-fridge-too-long ones. I like using them before they hit that mark. I cut up red onion, green peppers, celery, carrots, broccoli and red apple to put on top of the bed of lettuce. To this I added a sprinkling of walnuts, sunflower seeds and cheese. For myself I chunked up extra sharp cheddar and for Johnny, Meunster. His love of Meunster cheese borderlines on a psychiatric disorder. I added a splash of this really mild garlic Italian dressing (more for the olive oil part of it than anything), to a pan. A sprinkling of salt and pepper and then small cubes of 1 large and 1 small chicken breast. I hate when packages have such drastically different sizes, don't you? Cutting it up eliminates dealing with different cooking times and unequal portions. The cooked chicken debuted on top of the salad. Everything was covered in Drew's Raspberry salad dressing. Good stuff, you should try it. Now I was faced with a lot of food and nothing to put it in. The bowl is just so crammed in and deep. I didn't want that annoying spill-over each time you stab something with your fork. The plate is just so big and flat, I knew everything would move outwards over the edge. Why must I be cursed with this knowledge of "bowl-plates" and their perfection in situations like this? Then, it hit me. Pie plates. We have two. Perfect!!! Albeit, one has ridges around the edge for the crust and handles for easy oven handling, they worked awesomely. I found my "bowl-plate" substitute, finally. And, dishwasher safe, I might add. I'm a happy camper tonight. Bowl-plates! What a good idea. 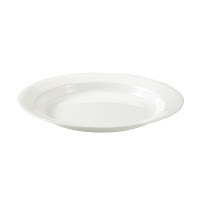 I think everyone growing up had Corelle plates in their life at one point or another! You should see if you can find them on eBay! All of our stuff is from Ikea and Johnny is very matchy-matchy. I'll have to see if they offer anything similiar so the cabinets aren't miscellaneous eBay items. It doesn't bug me, but I know it would him.